I have repeated numerous times that the Indian solar industry represents one of the biggest investing opportunities in the 21st century. However most of the opportunities are being missed as most solar companies concentrate their energies on building big solar farms using solar panels. 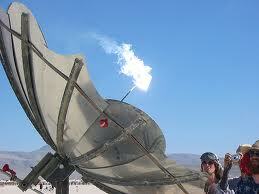 However there are a number of other areas in solar energy like solar cookers, solar lanterns etc. which are not getting the time and energy from companies. This has led to a glut of developers focusing on solar power plants leading to low returns and even losses in this area (read one of my earlier posts). These plants are also suffering from project delays and pathetic quality as competition has made many of these solar panel farms nonviable due to low bidding. However a company, Flareum Technologies has adopted a different long term, R&D focused effort concentrating on solar products like solar ACs, solar cooking etc. to exploit the Indian opportunity. Backed by a $12 million IFC loan, the company is expanding by hiring people from top schools like the IITs and IIMs. However it remains to be seen if the company can succeed as the returns on solar products are not that high. Also competition even in solar cookers and solar lanterns remains steep from ultra cheap Chinese imports. Though the company is adopting a R&D and patent acquisitions strategy, it is not going to be easy given the scale of the company. However, the Solar Product Industry in India is still in is nascent stage & faces challenges. Along with their advantages comes their disadvantages, which is unavoidable. You can get a relative idea by reading about solar cookers below. India has installed the world’s largest solar cooker at a cost of $280,000 system at Shridi subsidized by the Indian government, which generates 3,500 kg of steam every day to make food for 20,000 people. However despite attempts made by the Government to make this solar product popular lack of follow-on effort has made its efforts go waste. Slow Cooking and inability to cook outside of sunshine hours – Not all people will deal with such inconvenience which requires change if habits. Problem can be solved with a fossil fuel cooker in addition but that adds to the costs. Low Sunlight Places – Access to sunlight may be difficult in some Regions. Lack of Knowledge – Millions of citizens depend on kerosene and wood for cooking which is not only expensive but also leads to pollution. Lack of knowledge and trying something new are major hurdles. High Initial Cost – Indian income levels are quite low which makes buying solar cookers with even a $30 cost is unaffordable to most of the poor. The rich do not prefer solar cookers anyway. Solar Cookers are one of the most useful solar products but the lack of knowledge has not led to its widespread adoption. It is particularly useful in poor sunny countries like India where people are forced to burn high cost high polluting fuel for their cooking purposes. Solar Cookers have the following advantages. Easy to Make – Solar Cookers do not require state of the art hi-tech factories or expensive equipment to be manufactured. They are relatively easy to build. No Fuel Costs – Solar Cookers only requires sunlight for operation. Save immensely on Gas Costs over its lifetime. Easy Operation – Solar Cookers are not hard to operate. Working with wood is quite difficult. There are problems in gathering and burning which is avoided with Solar Cookers. Long Life – Solar Cookers have a long life of around 15-20 years. Multiple Cooking Possible – Solar Cookers can cook multiple items at one go and produces food which is healthy and not infested with any coal or gas residues. 1) Not Usable at All Times and Places – Solar cookers are less usable in cloudy weather and at high latitudes. Also, solar cooking provides hot food during or shortly after the hottest part of the day, rather than the evening when most people like to eat. 2) Takes more Time to Cook – Many solar cookers take longer time to cook food than a fuel-based oven. Using these solar cookers therefore requires that food preparation be started several hours before the meal. 3) Requires Different Cooking Technique – Cooks may need to learn special cooking techniques to fry common foods. It may not be possible to safely or completely cook some thick foods. Armed with a $12-million funding commitment from investor IFC, Flareum wants to use its band of new managers to create more IPR, develop new solar products and net more large corporate customers. Eventually, it wants to take its wares to Asia and Africa. “We have begun the process of filing for patents and we don’t rule out acquiring some too,” says Badal Shah, CMD, Flareum.It wants to use solar energy not to generate electricity, but as a source of power to cook food, provide steam to turn power plant turbines and help in the production of everything from leather goods to medicines. It wants to morph into the L&T of its market. “Most clean-tech companies are focused on refining their business model – on being first to market and on better and faster execution,” says Pravan Malhotra, who leads clean-tech investments for IFC in South Asia. “Flareum was a rare company that was instead pushing the innovation agenda. Low-cost product innovation will be the key to its success.” Flareum is helping large companies like Reliance Industries, IBM and Siemens use steam, generated using solar energy, instead of coal, gas, wood and even light diesel, as the fuel to run many.